Everyone Loves to get Letters! For many years, I have sent a letter to my soon to be students near the end of the summer. I do this to ease any anxiety some of them may have, to help them feel part of the class before they arrive and because…well…it’s a letter. Children do not receive letters very often, so print written just to them is significant. It’s a literacy thing. I’ve shared my letter before, but this year’s letter is a bit different. I decided that if connecting and learning with others around the world is an important part of our classroom learning, then I should let the students (and their parents, who will undoubtedly be the ones reading the letter aloud to the children) know about that right from the start. I wish I had been able to find a border that truly reflected the tools we are using in my classroom, but a traditional border had to suffice. 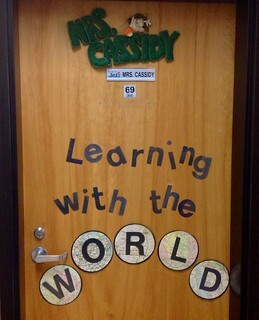 As I thought about this letter, I decided that I wanted my classroom door, which announces what we are all about, to reflect our connections as well. I’m so glad I get to be your teacher this year. I can’t wait to meet you! I’ve been busy in our classroom getting things ready for us to learn together. We are going to have an exciting year. You will get your own iPad to use in our classroom and we’ll find out how to use it to share your learning with your parents and other people who can help you to learn. The best thing about grade one, though, is that you will learn to read! We’ll read LOTS of books. I wonder what special things are interesting to you? What do you like to do in your free time? What do you like to read books about? What would you like to learn more about? I hope you will ask your mom or dad to email me with the answer to those questions. On the first day of school, I will meet you in our classroom (Room 69) at 8:50. Look for the door with some maps on it. Now, I’ve shared my letter. What do you include in yours? Great letter, Kathy! This year, I’m starting at a new school, so I included a photograph of myself. I was hoping this would help the students recognize me on the first day of school (and reduce some anxiety about the unknown). I also asked students to bring in something special from the environment that matters to them (eg, a rock, a piece of bark, a shell, or even an animal tooth). I thought that we could use these items for our first Wonder Centre, and they may also provide us with options for sorting, categorizing, etc. This also connects to Science. I always like getting students to bring in something (from a book to an object) because it gives them something to discuss with their peers on the first day of school and sometimes even makes them excited to come back. The books, A PLACE FOR WONDER and NATURAL CURIOSITY, helped me with this year’s idea. I’m excited to hear what others include in their letters! Thanks again for sharing yours! This is a great idea, Aviva. I actually did consider asking the students to bring in something, but wasn’t sure it would work in our particular situation. I do love the idea of the students starting to wonder right from the first day of school. Love the idea of asking them to email you to answer the questions. I’m going to add that to my letter this year. Thank you for your great posts. Children bring these in and we post them with their pic during the first week of school. I love this idea, Grace. It’s a great way to get students asking questions. I was contemplating doing exactly the same thing Kathy. What stopped me was a concern that my class list might change at the last minute and I would create some confusion for my students and parents. I thought it would be cool to enroll my students in at Moto over the summer so we could start talking to each other and I could find out a little bit about their interests. I love your letter. I did something similar this year. I teach mild special day class in middle school so I have most of my kids three years. Last year I had my 6th and 7th grader, now 7th and 8th graders, write letters so the new students. I figure this way the new students might also know a familiar student’s name. I’ve been wanting to get more world wide connectio in my classroom. I’ve been looking for a teacher who might want to be pen pals with my 12 students. I’ve tried twitter (@atomlinsteacher) but don’t have many followers so that word didn’t get out. Do you have any suggestions to creating contacts across the world? Sundar, I love your idea of having students write to new students. I do have a suggestion for you to help find classes to connect with. Try http://www.epals.com/. It is free to register and there are thousands of teachers from all over the world who are also looking for other classes to connect with. Writing letters to your new upcoming students is such a wonderful idea, both as a get to know you as well as encouraging and fostering literacy. I had never considered this before, but a few weeks ago friends of mine were posting on Facebook that their second grader just received a Welcome Letter from his new teacher-to-be. He was so excited, as were his parents. I think this is an idea I will (try to) adopt for next year. Someone’s idea of adding a picture is a terrific idea as well. We want our kiddos to be comfortable as well as inspired and enthusiastic on their first day. I have been inspired, thank you. I hope I can be as inspiring to others as well.